Yesterday’s mod was clearly indicated by comparing the directions to the photo. But today’s are a result of NOT wanting to make something that looks like the original. 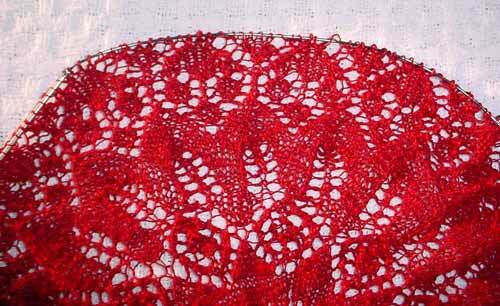 Around the outer edge of my doily are 24 arrowhead or heart-like shapes, with the pointy tip facing the thing’s edge. In the original photo and directions, these are oddly placed. While they could have easily fit in between the points of the larger leaf/tulip motifs in the previous ring of design, they are skewed off the repeat, almost as if they were tossed on as afterthought. I like the minor asymmetry of the base of the leaf/tulips. It made sense there both visually and in knitting logic. This outer ring’s perturbation however is just …odd. If anyone else is interested in doing this pattern, here’s the whole modification – rows 63-71. I’m using the pattern’s own notation system present in the rest of Nurhanne’s translation. Note that while it’s written for sl1-k1-psso type decreases, when working, I substituted SSKs throughout.